My trip to Austin started with a delay at JFK. However, it wasn’t all bad. The passengers were mainly people traveling to the conference so I was able to meet teachers and administrators from NYC schools, an education activist, and the Founding Executive Director and Dream Director of a company from Connecticut called Workspace Education who I actually sat next to on the flight down. Once I finally landed, I checked out The Lion & The Pirate open mic at Malvern Books. This is an inclusive open mic organized by Pen 2 Paper an arts branch of the advocacy group Coalition of Texans with Disabilities. I was only able to catch the tail end of the event because of my flight delay, but what I saw was a really powerful community of writers and musicians sharing some funny, touching, and moving work. I ended the night with SXSWedu’s early bird social. This is a pretty low key event for attendees who are in time to get their badges on Sunday night. As someone who is more introverted by nature, I find this event a nice time to warm up my networking skills before the conference really kicks off. After the keynote I spent time exploring the PBS Teacher’s lounge. This was one of the sponsored hang out spots throughout the conference offering coffee, snacks, refreshment, and more colloquial programming. For example, on my first visit to the lounge it was a conversation on media literacy led by a member of the PBS media team. PBS was also giving out T-shirts with their retro logo and I definitely waited in line for one. One of the best sessions I went to all conference happened this afternoon. I attended a panel entitled “Art as a Pathway to Health & Wellness.” The session was hosted by Head Starter Network and consisted of Jeanette Betancourt of the Sesame Workshop (aka Sesame Street), Lee Francis of Native Realities a publisher who, “strive[s] to give you the most original and authentic representations of Native and Indigenous peoples through stories and texts that educate and entertain children, youth and adults,” Melissa Menzer from the National Endowment for the Arts, and Jane Park Woo from the Clinton Foundation. It was a fascinating discussion on the role art can play in human development and how it scientifically impacts our emotional and physical health. I learned the term “neuroasthetics” which is, “a new field of research emerging at the intersection of psychological aesthetics, neuroscience and human evolution. The main objective of neuroaesthetics is to characterize the neurobiological foundations and evolutionary history of the cognitive and affective processes involved in aesthetic experiences and artistic and other creative activities.”  I had never heard of the term before and now I keep digging into it as it seems so central to the work I’m doing in the poetry workshops. 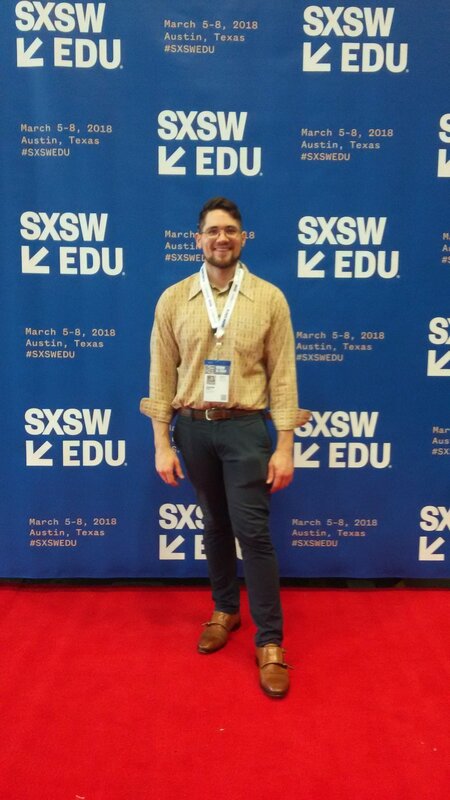 Donnie Welch a young white male with brown hair, a beard, and glasses stands on a red carpet with a blue banner for SXSWedu 2018 behind him. The blue banner his SXSWedu 2018 and the event details in white-yellow hued text. Welch is wearing tan dress shoes, blue pants and a paisley shirt. The session went really well and was definitely a step up from anything I had previously done as a speaker or presenter; as evidenced by my being given a clicker for slide changes! For real though, people in the audience were receptive and interested. I had educators, parents, and administrators coming up to pick my brain later, and after the conference received a tweet from a librarian who made use of the information I shared as soon as she got back to work. After my session and a lunch break, I checked out the talk, “Fellowships Are the Next Big Youth Extracurricular” led by Yerba Buena Center for the Art’s Jonathan Moscone. He shared stories from the Youth Fellows program YBCA runs, “a yearlong paid fellowship for high schoolers that places them at the intersection of art and activism.”  It’s a fascinating initiative that places youth in the driving seat of art and change in their own neighborhoods. One of the highlighted projects paired young artists and designers with a neon glass company so that they could create new lights for their local bodegas. The lights would depict fruits, vegetables, and other healthy food rather than the alcohol neons that storefronts are given promotionally. The Youth Fellows were responsible for budgeting this project, forging connections with the stores in their community, and completing the creative piece as well. Really cool stuff! I gave myself the morning to explore Lady Bird Lake and the Barton Springs Greenbelt. These are part of a really gorgeous urban park network that offers amazing natural scenery and views of the Austin skyline. 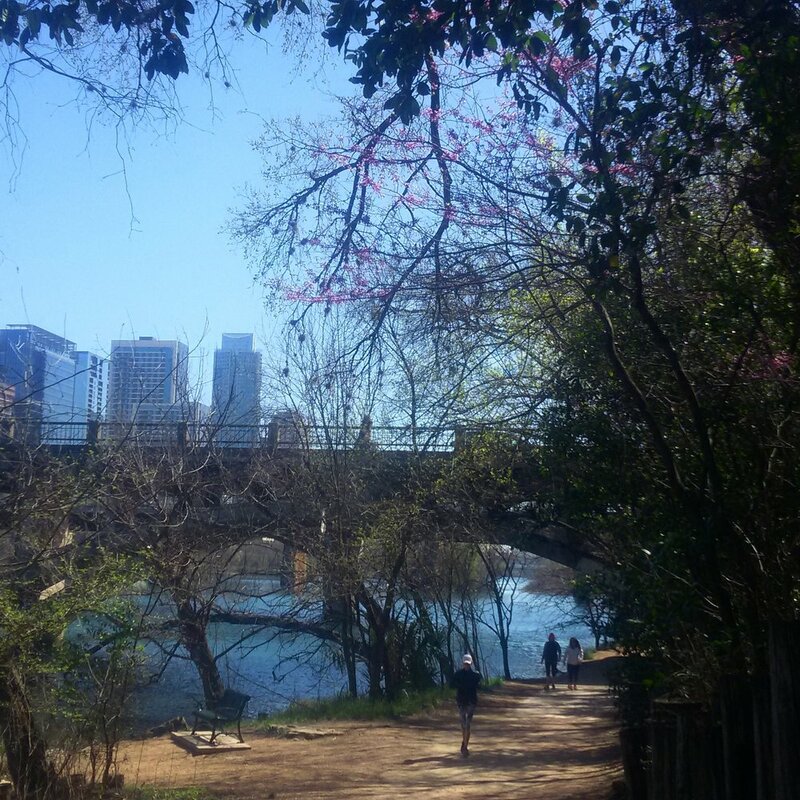 The Barton Springs Greenbelt alone has over twelve miles of hiking trails! In the foreground is a fairly wide dirt path with a metal bench, one person running, and two people walking together. Beside the path is a river. The path is covered in trees, some green with leaves others with small purple/pink buds. In the background is a bridge and beyond that are skyscrapers in the Austin, TX skyline. After a couple hours hiking and enjoying the warm weather I returned to the conference to hear a featured conversation: “National Arts Networks & Stories of Impact.” This was a conversation between the Kennedy Center’s Mario Rossero and Hakim Bellamy a Citizen Artist Fellow with the Kennedy Center and the inaugural Poet Laureate of Albuquerque, NM. While much of the session involved stories directly related to the Kennedy Center’s work, Rossero and Bellamy both brought a wealth of experience, albeit slightly different perspectives, so their conversation had real wisdom about building community through arts programming in schools. I spent the rest of the day popping in and out of some of the more informal, quirky, and hands-on sessions like “Make a Food Computer” and “Virtual Voyaging Through California State Parks” which offered ways to blend ecology, technology, and outdoor education. The last day is always fascinating because downtown Austin transforms itself in preparation for the main SXSW music and film festival which begins the following week. Much like the city, I decided to prepare for the future, and attended a Panel Picker 2019 meetup to receive some insight into what the programming committee is looking for in next year’s conference. Then, before my afternoon flight home, I caught the first of the three closing keynotes: “Who Has the Right to Education” by Dr. Alaa Murabit. This was an amazing investigation into the root causes of inequality in education, especially in relation to women’s education, and suggested points of entry for teachers to start instilling change in their own classrooms and schools. I left Austin (my flight delayed again, but only a half-hour this time!) ready to push myself as an educator and help my students achieve more and dream bigger. This conference is always a blast. I find it especially inspiring because of its bend toward innovation. SXSWedu is a space that accepts, welcomes, and showcases new ideas in the field rather than rehashing the same researched notions. It draws a crowd of practitioners who are willing to experiment in order to improve their efficacy as teachers and classroom leaders. This cohort is the community I always seek out when attending other conferences, so it’s a motivating feeling to be with spend a week, learning and discovering, alongside forward moving, forward thinking teachers and educators..